African-related organizations are invaluable resources for learning more about Africa, planning activities and community events, and getting involved for positive change in Africa. Use these links to PBS Web sites on Africa, African studies outreach programs, additional curriculum resources, trade organizations, study programs/fellowships in Africa, donor agencies, and major African Web sites to learn more about specific African issues of interest, programs and organizations with whom to collaborate, and worthy causes and movements to support. Explore the life of one of the 20th centurys greatest activists and statesmen. The Triumph of Evil is a vivid and revealing report on how the 1994 Rwanda genocide could have been prevented. Drawing on dramatic footage, previously confidential cables and interviews with U.N. and U.S. officials, Frontline investigates how months earlier the U.S. and U.N. had been warned by a key Rwandan informant about the coming slaughter. Despite the warning, the West didn't try to prevent it. On October 3, 1993 elite units of the US Armys Rangers and Delta Force were ambushed by Somali men, women and children armed with automatic weapons and rocket-propelled grenades. The Rangers were pinned down in the most dangerous part of Mogadishu, Somalia and taking casualties. What had started out as an operation to capture warlord Mohammed Farah Aidid turned into a tragic firefight that lasted seventeen hours, left eighteen Americans dead, eighty four wounded and continues to haunt the US military and American foreign policy. This is the story of the history-making journey of two extraordinary men  Archbishop Desmond Tutu and Dr. John Hope Franklin, leader of President Clintons Advisory Board on Race  and a multi-ethnic group of 21 teenagers. They come together for the first time on the infamous island of Goree, a former slave port off the coast of Senegal to talk frankly about issues of race and imperialism. Southern Africas Etosha is a vast and ancient land of seasonal paradox. During the blooming of the wet season, this an Eden of glorious abundance in which spring boks, elephants, lions, leopards, cheetahs, jackals, zebras, and giraffe thrive. Namib is a two thousand kilometer strip of land on the southwestern coast of Africa where the cold Atlantic sea and searing Namibian desert join. With few watering holes, animals must roam the beach and seek nourishment from the bountiful marine life. Travel to Ngorongoro to learn about craters, cheetahs, wildebeests, jackals, and more. Retrace Hemingways footsteps on a Kenya safari. Sample the safari game, race with cheetahs, and learn about the life of a wildlife photographer. Travel to Namibia, one of the world's richest cheetah habitats, for a remarkable look at these graceful hunters. Follow six gangly young cheetahs as they come of age in the desert wilderness of Etosha National Park, where they learn the essential hunting and social skills that will enable them to rear families of their own. Meet Barine Wiwa-Lawani, a refugee from Nigeria and sister of Ken Saro-Wiwa, a writer and activist who was executed by the Nigerian government in 1995. Join Barine as she returns to Nigeria for the first time in several years to attend her brother's long-delayed funeral. With real-time dispatches and digital photos filed from the Nile in March 1999 and from a quarry in Massachusetts in August and September 1999, the adventure chronicles both NOVAs search for archaic clues to obelisk-raising, and its attempt to erect one of these pillars of stone itself. Learn what happened, meet the team, and try to lever your own obelisk. NOVA brings together a team of Egyptologists, engineers, stonemasons, and timber framers to probe the mystery of how the ancients shaped, transported, and erected their elegant obelisks. This site chronicles the underwater discovery of the fabled Pharaohs lighthouse, one of the Seven Wonders of the Ancient World, just offshore from the modern city of Alexandria in Egypt. From beetles to bustards and hyenas to hedgehogs, meet the wildlife that populates this fantastic land. Join in as scientists discover a lost city and learn the secrets of its forgotten inhabitants. Examine 7,000 year old DNA and find out what it reveals about the mysterious past. Get travel and cultural information, including a virtual slide show and interactive map features on the Web site. Join Henry Louis Gates, Jr. as he travels the continent of Africa, exploring its rich history and introducing you to contemporary African people and cultures. Contains K-12 materials and recommended titles on Africa for children and young people, an annotated bibliography listing over 500 titles referenced by grade level. Developed by Peace Corps volunteers, these global lesson plans include many Africa resources for teachers (Grades 3-12). A non-profit making network dedicated solely to the dissemination of information on Africa. The mission of the AERN is to focus attention and to mobilize resources for the study of the highest priority problems of African educational development. An introduction and guide to the related CD-ROM project. Online resources include country profiles, a databank of 47 lesson plans for K-12 teachers, and a Teacher's Forum with a discussion group and chat room. Features one nation every month using a very kid-friendly format. Eighteen nations have been reviewed to date. The site also has sections called: Fun & Games, Brain Teasers, Myths & Fables, and Discover Africa. Paper presented at the 1996 Annual Meeting of the African Studies Association. Developed by H-Net (Humanities and Social Sciences Online), this excellent site offers Discussion Lists, Lesson Plans, Unit Outlines, Course Syllabi, Perspectives on Stereotypes, and reviews of educational materials. Includes links to African Studies Programs, electronic journals and newspapers, and African Studies resources by region, country, and topic (including Teaching Resources). Links to indexes and curriculum-based resources for teaching about the arts and culture of Africa. Africa-related materials include maps (How Big is Africa? 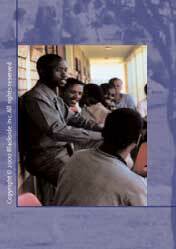 ), posters (Math of Africa), videos (The Roots of African Civilization) and more. Features the people, the land, the wildlife and the national parks of Africa. Includes games, virtual postcards of African animals, different quizzes for elementary and high school levels, and more. This web site features two very interesting Africa-related pages, Escape from Slavery and In Search of Human Origins. You'll also find lessons designed to help teachers bring geography into the classroom. National Geographic also offers a comprehensive atlas that features maps, national flags, and basic geographic, demographic and political information on African countries. Curriculum materials for grades 6-12 with a focus on contemporary issues and their historic, geographic and cultural context. Outreach in the African Studies Program offers faculty, staff, and students from any institution to use the numerous videos, slides, and teaching resources available from the African Studies Program. Contains a variety of information for teachers of grades K-12. These resources are kept up-to-date in order to provide general and in-depth information about Africa. A compilation of curricular units created by teachers in the annual summer Yale-New Haven Teachers Institute. The AAIs mission is to expand education and professional training opportunities for Africans, foster greater understanding of Africa in America, and promote mutually beneficial US-Africa relations. The Africa Fund works for a positive US policy towards Africa and supports human rights, democracy, and development. The Africa Liaison Project fosters communication, cooperation, and collaboration on development initiatives in Africa. APIC is a not-for-profit organization supported by churches, trade unions, and civil rights groups that works with Congress on Africa-related legislation. An organization dedicated to the development of trade and cultural ties between the United States and Africa in the areas of telecommunications, education, technology, tourism, medicine, and business development. Africare is a nonprofit organization that administers and performs development work throughout Africa. ACAS is a group of scholars and students of Africa dedicated to developing communication and action networks between the peoples and scholars of Africa and the United States, and mobilizing support in the US on critical, current issues related to Africa. The organizations mission is to mobilize and foster increased cooperation and coordination among a broad-based coalition of American, African, and international organizations, institutions, and individuals committed to the progress and empowerment of Africa and African peoples. The Corporate Council on Africa is a non-partisan, membership organization of corporations and individuals dedicated to strengthening and facilitating relationships between African and American individuals and organizations by creating educational, cultural, and commercial exchange opportunities. The mission of the Foundation is to implement the principles of culturally based democratic government within African society, bringing the countries of Africa into the mainstream of the global economy through free enterprise, thus cultivating the pathway for peace and prosperity from resulting economic opportunity. Global Alliance focuses on regions in Africa that lack adequate medical care because of poverty, isolation, lack of education, and the unequal distribution of health care services. Global Alliance encourages self-reliance, independence, and the ability of Africans to ensure for themselves an improved quality of life. TransAfrica is a foreign policy research and lobby organization with a focus on Africa and the African Diaspora. The foundations mission is to bring together the spirit of free enterprise, knowledge, and humanitarianism by organizing positive self-enriching economic, educational, and cultural experiences that transcend racial, ethnic, and religious divides in the United States and Africa. The Washington Office on Africa is a church-sponsored nonprofit advocacy organization seeking to articulate and promote a just American policy toward Africa. Offers 12-24 month grants to African academics and professionals under its Gray Senior Fellowships Program. Councils International Study Programs Division (ISP) offers educational programs abroad for students and faculty. In addition, ISP is for the publication of the Journal of Studies in International Educational Exchange, which provides a forum for noteworthy scholarship and provocative thinking about efforts to provide quality international educational exchange programs. available of programs for study abroad in Africa available to U.S. students. An African Web portal that lists detailed resources for various subjects like business, education, womens issues, and youth. Up to the minute news about Africa. Web site features an extensive Politics section, and a two-part section for Current News (newspapers and news agencies). Web site focusing on the African Diaspora. Includes information on travel and different countries throughout Africa. Great Web site that explores all of Africa and is aimed at the Holland-Africa relationship. Major African news Web site that incorporates PANA and African news online. Information and great links to African countries. An African Web portal targeted at white Africans. A US-based African professional newspaper. Highest circulating newspaper serving African, African-American and American business professionals. Information on the relationship between Africa and the US. A major African search engine based out of South Africa.